The Google Pixel is probably at the pinnacle of Android smartphones right now. After shelving the Nexus program, Google embarks on a new path of making a device that is truly their own. What this basically means is that you can say goodbye to the affordable price points that the Nexus were known for as the Pixel is being marketed as a flagship, and with it comes a flagship price. Read up on our previous coverage of the Google Pixel announcement here to brush up on its best features. Well, for Singaporeans, the agonising wait is over, as one our biggest e-commerce sites has just started selling it. On top of that, we also searched for other avenues of purchase that you might want to consider if the first option has none left. 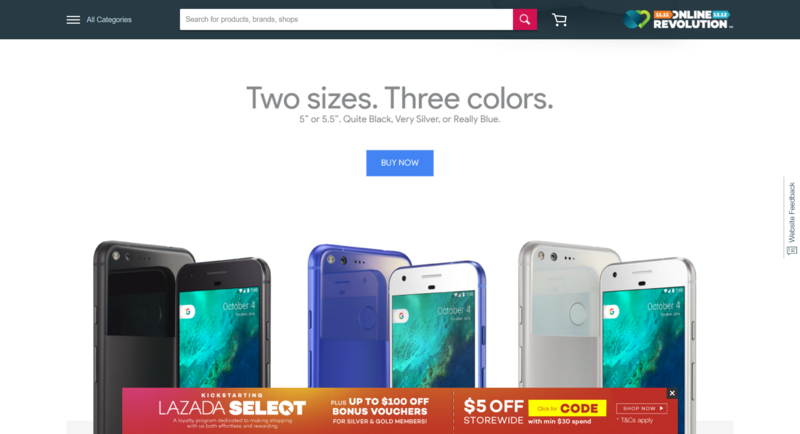 Lazada today announced that the Google Pixel has been put up for sale at the stroke of noon. What’s more, they’re stocking the entire Pixel range, with both the regular and XL models in 32GB or 128GB variants, and in all three colours. 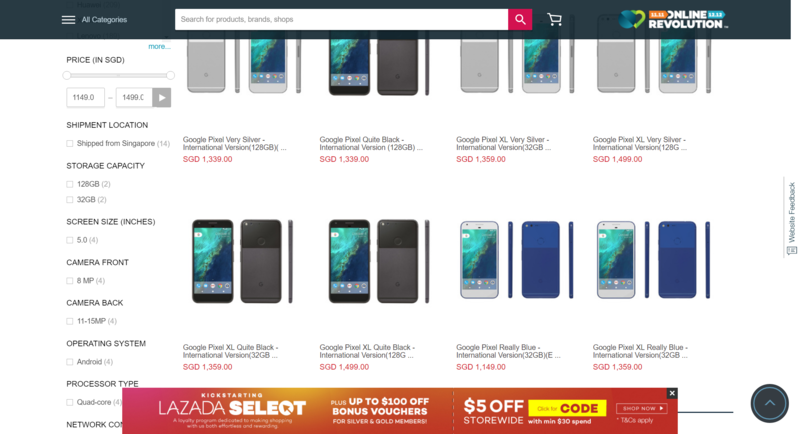 The phone is sold through Lazada themselves, and the prices are… a bit hard to swallow. The base Pixel at 32GB costs S$1,149 and the 128GB model is S$1,339. The Pixel XL, on the other hand, starts at S$1,359 for the 32GB model, while it costs S$1,499 for the 128GB one. Something to note; Really Blue is only available in the 32GB variant. Bad news – at the moment stocks sold directly by Lazada are soldout, and this includes that much loved blue colouration. The good news? Other merchants on the platform are selling imported sets though you will have to live with the smaller Pixel, and in only White or Black. 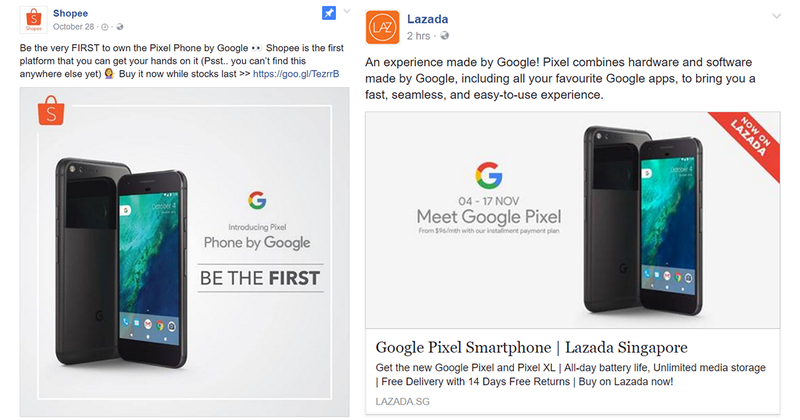 Actually, Lazada isn’t the first in Singapore to go public with having the Google Pixel on their platform. 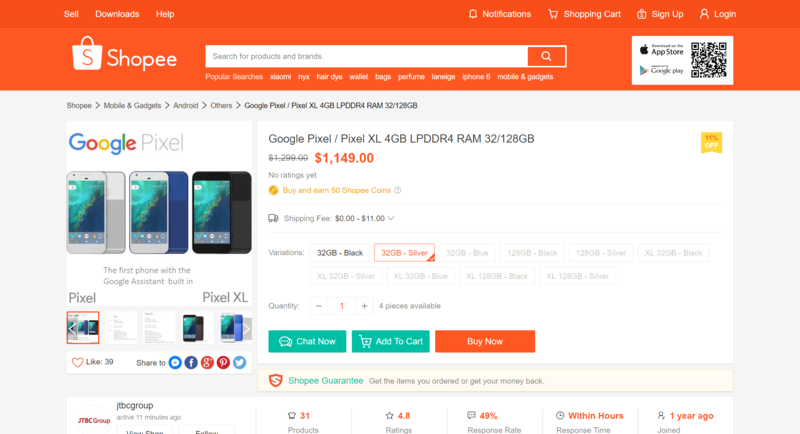 Since late October, Shopee has had the Google Pixel on its site through one of its merchants, JTBC Group. Judging from the listing, they too, had the entire range of the Pixel and Pixel XL, but it is now largely sold out except for the 32GB Pixel in Black or White. Another way to get you hands on the Pixel is through local handphone store Mobyshop. 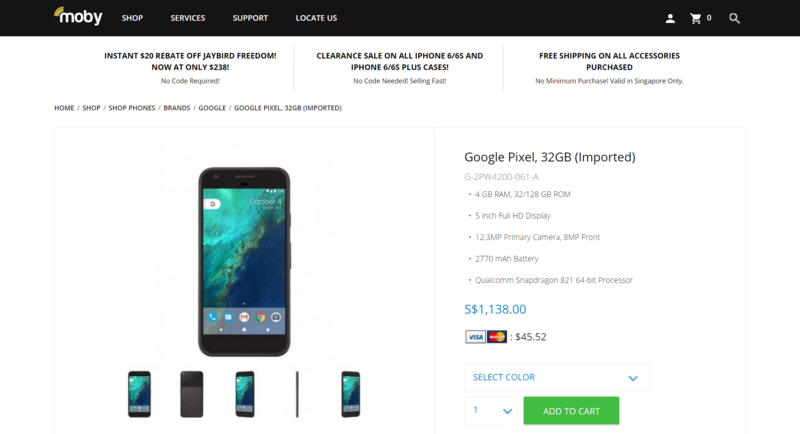 Available through their online store is the Quite Black 32GB Google Pixel. Rumours are, that they used to have more varieties of the Pixel available, but have since sold out. The good thing about them, though, is that the have a physical store located at Far East Plaza, so if you do not want the anxious feeling of waiting for a delivery to arrive, they are the place to go to. Judging from how the phone has basically wiped out from these stores, it seems that there is significant interest in this phone. Or maybe they’re just bringing them in very small quantities. Either way, I have yet to encounter anyone using a Pixel in my daily transit on public transportation, and it’s still largely an Apple and Samsung affair. And this even before going through the ways which you could get yourself a set from countries like the US and Australia where Google has been openly selling them. Regardless, at least we know that Google is doing something right with their new phone. I only wish that Google branches out their Play Store for devices into Singapore right now, because it has been long overdue.